For the 1st time in quite awhile, I have run 4 days in a row. While they haven't been long mileage runs, it is nice to get out and just run. Saturday was a trail/bike path warm up for the Run for Dad 5k. Sunday was the Run for Dad 5k. Monday, 4.2 miles on the boards in Wildwood! More on that in a bit..
Tuesday, and out and back down 5.2 mile run. I had to head down to Wildwood Sunday nite, to get our place ready for the wife and kids, since we had renters in last week. SO, what do you do when you get up on Monday? 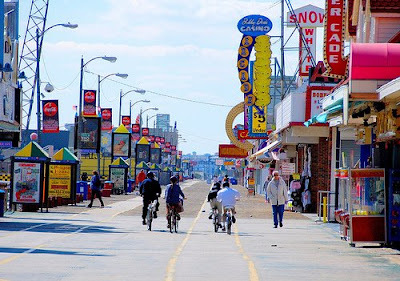 Go for a run on the boardwalk! Nothing better than running at the shore. There were a few runners out and about, which is a nice site. I took it pretty easy, running the 4.2 miles in 36:13, a 8:37 avg. Today's run, I felt good when I started, but faded in the end. I think it was the lack of fluids. I didn't drink any water in the afternoon, and it was warm out, my guess is high 70's and you could feel the humidity building, around 5:30pm, when I went for my run. With the weather warming, I need to remember to hydrate myself during the day. Again, what I need to do, is start slower, and negative split my runs. I am too much of a rabbit. Luckily, when I ran the Philly Marathon, and Long Branch 1/2, I was smart enough to start out slow! Hopefully I can make that the norm for all of my runs. Gotta love the info from the Garmin! Looks like I won't hit 100 for the month, but that will change shortly, as my fall marathon training will start in at the end of July. I think I'll take Wednesday off, and get back out there on Thursday. great stats!! I think 4 days of running in a row would make my body react very badly... looks like you're going strong! well done! Great job!! I'm dying for a run on the boardwalk...you guys are killing me! They're still doing the tram cars down there? Cool!!! I have to bring the kids down there. I'm glad you've been able to get 4 days in a row of running. Feels good, huh? I see your paces are all still really good. So, refresh me on your Fall plans? Are you doing Philly again? I think I'll be down for the half. "Watch the Trame Car please" "Watch the Trame Car please". I don't care to admit how many Snow White Burgers I would eat back in the day. 4 days of running??? You rock! I can barely manage 3. Which marathon are you doing? I think my record was doing for 32 days in a row. I need to check my blog on this one. Thinking of doing 33 consecutive days of running ?? Hee hee ! SS & IRFF, I am in for the PDR, Asbury Park Marathon in Oct (only as a training run!) and Philly in Nov.
And Ted.. NO! No way am I going to run for 33 days. I didn't run today(Wed) so the streak is over at 4. Great job on the 4 days in a row! I can't get up on the boards. I'm tired of getting clipped by bikes & surreys!! Nice work on those runs! And the stats are impressive indeed. A month away from the Garmin anniversary and you're way over 1000 miles - fantastic! It's great to be able to look back at all the stats and see how far you've come. I'm slacking on keeping mine since my three month running layoff. I'm still standing ... and running!